Ever since becoming a Microsoft PowerShell MVP back in the summer of 2014, I have been heavily involved with various PowerShell Desired State Configuration (DSC) projects. The main initiative I have been involved with is the SharePointDSC module which is currently led by Brian Farnhill down in Australia. While my contributions to the core of the project have been limited, I have been spending numerous hours working on a new concept I came up with and which is very close to my heart. Reverse DSC is something I introduced back in late 2015 after spending some late night hours testing out my SharePointDSC scripts. It is the concept of extracting a DSC Configuration Script out of an existing environment in order to be able to better analyze it, replicate it or onboard it onto PowerShell DSC. Let me be very clear, this concept does not only apply to the SharePoint world; it applies to all software components that can be automated via DSC. I am of the opinion that this concept will be a game changer in the world of automation, and I strongly encourage you to read through this article to better understand the core concepts behind it. 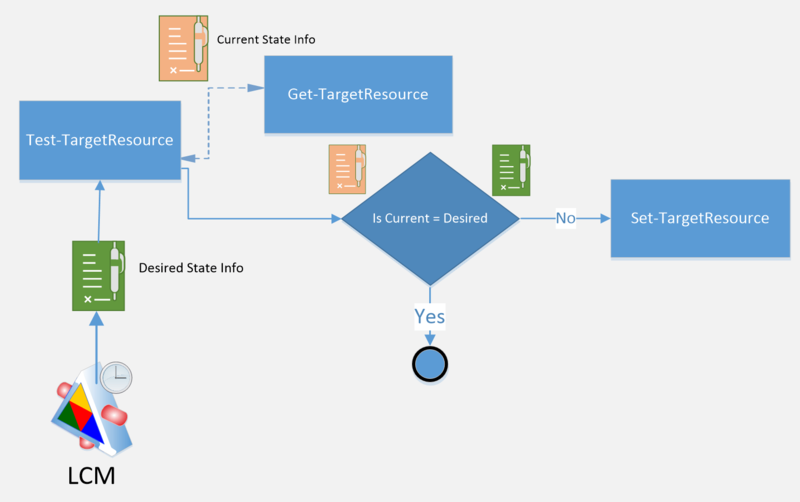 Desired State: represents how we want a component to be configured. For example, the Desired State of a SharePoint Site (SPWeb) could be defining its title. The Desired State could in this case define that to be in its Desired State, a given Site needs to have a title of “Intranet”. Current State: represents how a component is currently configured. In many cases the Current State can be the same as the Desired State, which is completely fine. PowerShell DSC aims at making sure that whenever the Current State is not equal to the Desired State, that we do everything in our power to bring the server node back in its Desired state. Before we go any further, it is key to understand how DSC Resources work internally. Just as a refresher, a DSC Resource is responsible for configuring a specific component within a DSC module. For example, within the SharePointDSC module, the MSFT_SPWebApplication resource is responsible for configuring SharePoint Web Applications. Every DSC Resources are made of 3 core functions: Get-TargetResource, Test-TargetResource, and Set-TargetResource. Set-TargetResource is the function responsible for bringing the server in its Desired State by configuring the given component represented by the resource. It is called on the initial configuration call (e.g. Start-DSCConfiguration for Push mode), and when the Local Configuration Manager (LCM) is in the ApplyAndAutocorrect mode and detects that the machine drifted away from its Desired State. Get-TargetResource is the function responsible for analyzing what the current state is for the component represented by the DSC Resource. Test-TargetResource is responsible for calling the Get-TargetResource function to obtain the current state, and compares it with the Desired State contained within the Local Configuration Manager. If it detects that the current state doesn’t match the Desired State, and the LCM is in ApplyAndAutocorrect mode, it will call the Set-TargetResource method to ensure the machine is brought back in its Desired State. The figure above details the process of PowerShell DSC where the Local Configuration Manager is configured in ApplyAndAutocorrect mode. The LCM checks on a regular basis (defined by the Configuration Mode Frequency) to see if the server is still in its Desired State. To do so, it calls into the Test-TargetResource function. This function is aware of what the Desired State should be because it is stored in the LCM’s memory (use the Get-DSCConfiguration cmdlet to see what is in the LCM’s memory), but needs to call into the Get-TargetResource function to figure out what the current state is. Once that is done, the Test-TargetResource method has information about what both the Desired and Current states are and will compare them. If they are the same, we are done and we will check again later. If they differ, then we need to call into the Set-TargetResource method to try to bring the Current State back to being the same as the Desired State. The magic of the Reverse DSC concept lies within the Get-TargetResource function. As explained in the section above, this function is responsible for obtaining information about the current state of the server node for a given component. So you may ask if the theory is that if, for example, I wanted to get information about all the Web Applications within my SharePoint environment, all I have to do is call into the Get-TargetResource function for the MSFT_SPWebApplication DSC Resource? Well, that is absolutely correct, and this is what Reverse DSC is all about. A Reverse DSC script is a dynamic PowerShell script that calls into the Get-TargetResource function for each DSC Resource contained within a DSC Module. 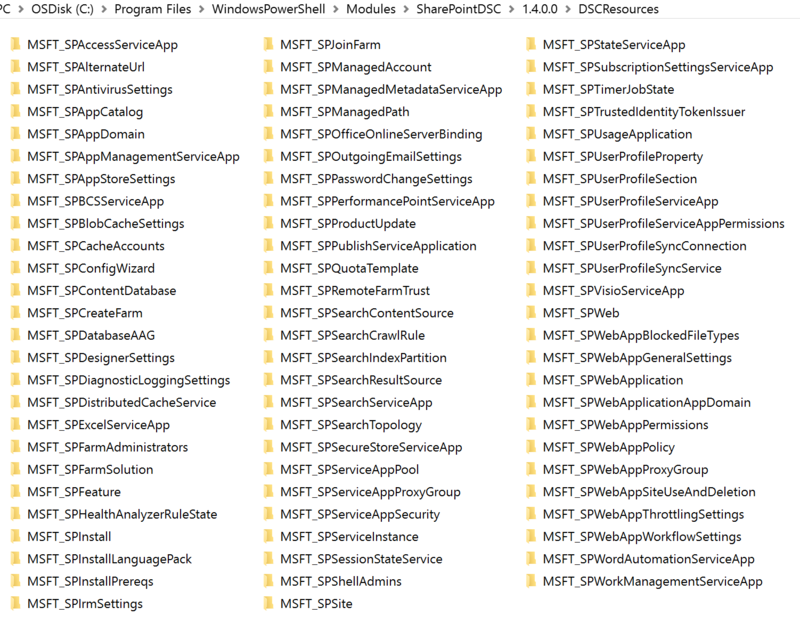 In the case of SharePoint, that Reverse DSC script would be calling into the Get-TargetResource function for all DSC Resources listed in the following figure (note that the figure shows the components included in SharePointDSC v1.4). The Reverse DSC script would then be responsible for compiling the current state of each DSC Resources into a complete DSC Configuration Script that would then represent the Current State of each components within our environment. If that ain’t cool, I don’t know what is! Dev/Test: As mentioned above, one of the main use of Reverse DSC is to allow an as-is replica of an existing environment on-premises. Most organizations I work with don’t have good DEV and Quality Assurance environments that match their Production environment. Running the Reverse DSC script against the production environment will allow users to take the resulting scripts and create exact copies of that environment for DEV and Test purposes. Azure Automation: Organizations that have an on-premises Production environment and that are looking at moving to the cloud (even if just for DEV/Test), can generate use the Reverse DSC script to generate the DSC Configuration matching their on-premises environment, and Publish it to Azure Automation to have Azure Virtual Machine created that will be an exact match of the on-premises environment. Compare environments: How often have we heard the sentence: “It works on my machine!”. With Reverse DSC, we can now run the script against two environments and compare the resulting scripts to see what configuration settings differ between the two. Documentation: While I don’t foresee this as being the most popular reason why organizations would be adopting Reverse DSC, it would still allow them to document (in DSC format) the configuration of an environment at any given point in time. DSC On-boarding: This one is probably one of the key application for DSC adoption within an organization. Most companies today aren’t using DSC to automate the configuration of their environment and ensure they don’t drift away from the specified Desired State. By simply running the Reverse DSC script against an existing environment and then using the resulting script as its own Desired State Configuration script, will ensure the environment is now maintained by the DSC process. It is almost as if by running through this process you would tell the server: “Tell me what your Current state is. Oh and by the way, that Current State you just told me about has just become your Desired State”. By doing this, organization can then specify how the LCM should handle configuration drifts (ApplyAndMonitor or ApplyAndAutocorrect) and detect when the Current State (which is now also the Desired State) is drifting. The Reverse DSC script for SharePoint is already a real thing. However it is still waiting final approval to become officially part of the SharePointDSC module. The following video shows the execution the Reverse DSC script against my SharePoint 2016 dev server. Hello Nik, Thank you for your article ! It seems really promising and interesting. Are you willing to share the script prior waiting for SharePointDSC validation ? What about registry keys? Or is this only looking for features and feature settings. It does not allow you to directly retrieve registry keys. Not sure why you would want it to. What did you have in mind?